No no, seriously – I skaaaa-wheeeeeeeled with joy when I tasted one of these bad boys. Last week we went on a road trip for business and I loaded an ENTIRE tub of freshly washed cherries to snack on. I promptly forgot about said cherries for the three days and when I unloaded them from the car around midnight on Fri night, it was…manky smelling. Instead of listening to C and just pitching the lot, I threw out the yucky ones, rinsed off the good ones, and laid them out on a Silpat to dry overnight. In the morning I popped the sheet pan into the oven (I think it was 350ºF) and walked away. Actually, I set the timer for 30 min, and then I walked away. I remember smelling something burning about *ahem* 40 minutes later and RUSHED into the kitchen to remove said pan from the hotbox. Luckily, the cherries had shriveled their sweet sweet goodness into morsels of dark chewy joy, not a lump of black crap (which is precisely what my blueberries did. Did I mention that I tried to roast them too? No? Ok. Now you know). So I snatched the hot pan outta the oven, bemoaned my sense of time, and then off-loaded my un-burnt cherries onto a pretty plate. I let everything cool while I prepped the twins’ breakfast – did I mention that this happened BEFORE breakfast? I’m a little nutso-crazypants in the mornings. 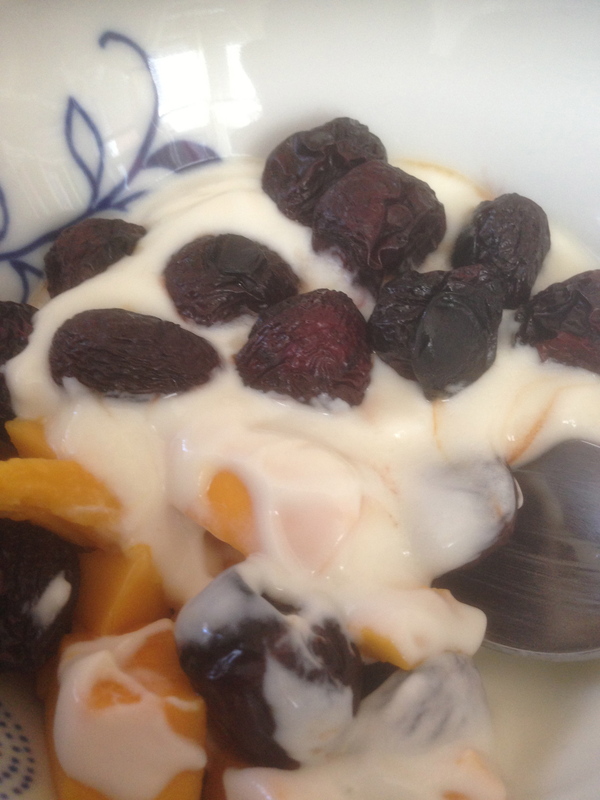 After the twins were seated and snarfing their b-fast, I grabbed some plain yogurt, sliced up a mango, and topped the bowl with my cherries. I nearly *SWOONED* on the spot. I shoulda removed the pits first. Yes. I learned that the hard way. YOU MUST TRY THIS TO BELIEVE IT!! 2- Rinse and dry your cherries. PIT THEM PLEASE. I left mine whole, but you could try slicing them too… Let me know how that goes? 3- Lay out your cherries on a silpat, some parchment paper or whatever you generally use. I wouldn’t try to grease a cookie sheet because the added grease might be funky on your cherriliciousness. But if you wanna try it – Go for it! Just let me know after how it turned out, okay? Good. 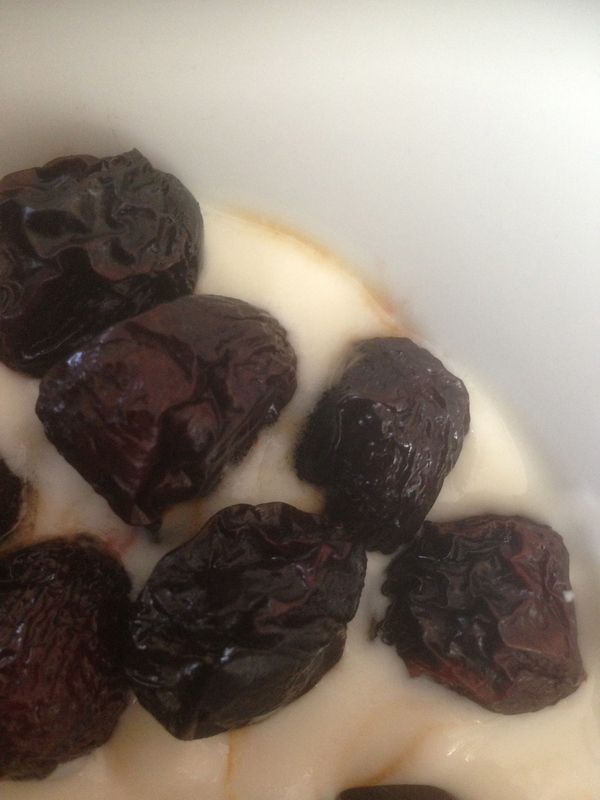 4- Roast for 25-35minutes, until the cherries are shriveled and look like oversized raisins. 5- Let them cool for 10+ minutes, if you can handle it. ENJOY! The four I allowed him to have. Can you imagine a roasted cherry MARTINI?? How about topping a fresh white cake that’s slathered with vanilla frosting with several several handfuls of these beauties?? 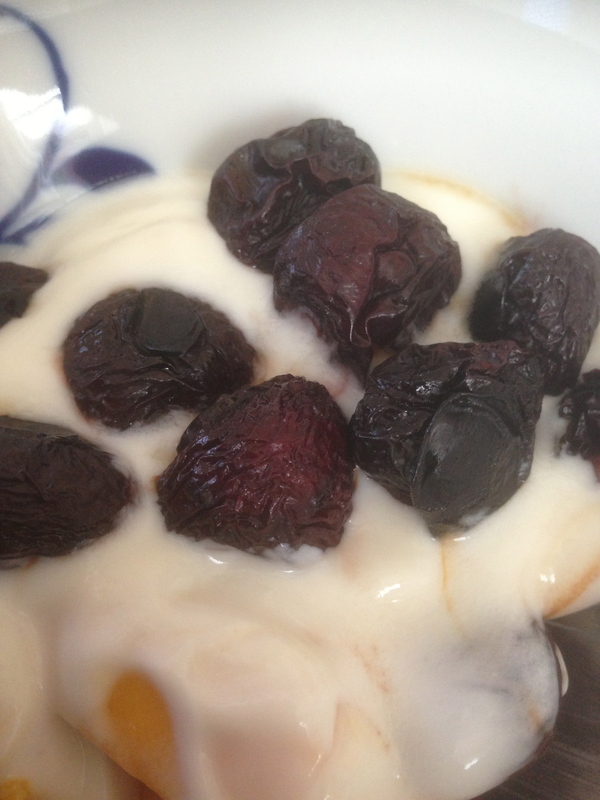 Hot roasted cherries over frozen hard creamy melty goodness? ?